We all know that breakfast is the most important meal of the day, and chocolate is one of the most important food groups (yes, it is a food group). So logically, the two should go together sometimes! Now, we aren’t saying you should skip out on healthier breakfasts like yogurt, berries, cereal, eggs, or whatever else you like in the morning, but sometimes, you can’t go wrong with a muffin that is more like a cupcake. And when it has a peanut butter swirl? Doubly irresistible! Plus, we just really like to make muffins. These are scarily easy to make, and contain basic ingredients- no fancy unsweetened or bittersweet chocolate are in these! While these are sweeter than most muffins, they aren’t sickeningly sweet to eat early in the morning. Our family really enjoyed them! Preheat the oven to 350˚ F. Line muffin tins with paper liners. To make the batter, combine the butter and 1/3 cup of the chocolate chips in a heatproof bowl set over a pot of simmering water. Heat, stirring occasionally, until the chocolate and butter are melted and smooth. Set aside. In the bowl of an electric mixer combine the flour, sugar, cocoa powder, baking powder, baking soda, and salt. Mix briefly to combine. In a liquid measuring cup, combine the buttermilk, egg and vanilla and whisk until combined. With the mixer on low speed, blend in the buttermilk mixture just until combined. Blend in the melted chocolate mixture. Stir in the remaining chocolate chips with a spatula. Divide the batter between the prepared paper liners, filling each no more than 2/3 full. To make the peanut butter swirl, combine the peanut butter and butter in a heatproof bowl and microwave briefly until smooth. Whisk in the confectioners’ sugar and milk until smooth. 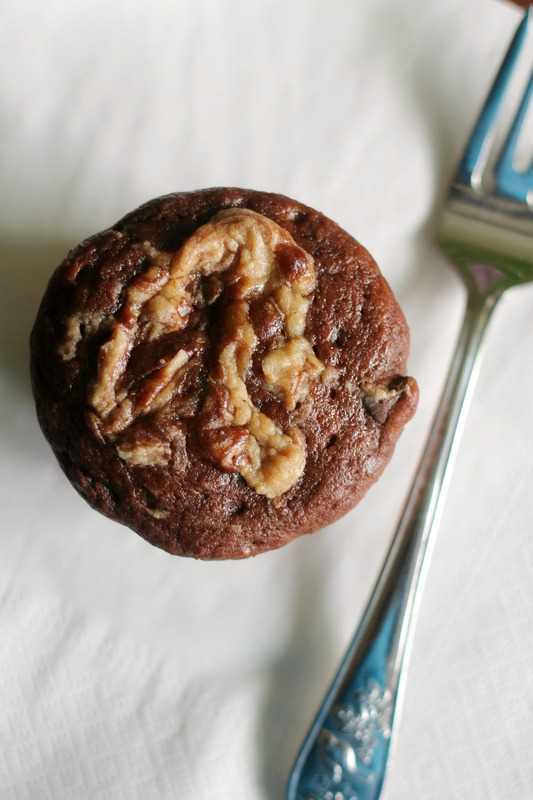 Drop a small spoonful of the peanut butter mixture on top of the chocolate muffin batter. Swirl together using a skewer or knife. Bake 20-22 minutes or until a toothpick inserted in the center comes out clean. Let cool in the pan 10 minutes, then transfer to a wire rack to cool completely. Enjoy! What an awesome flavor combo for a muffin! My hubby would love these! Peanut butter and chocolate is the best :). These muffins are great! 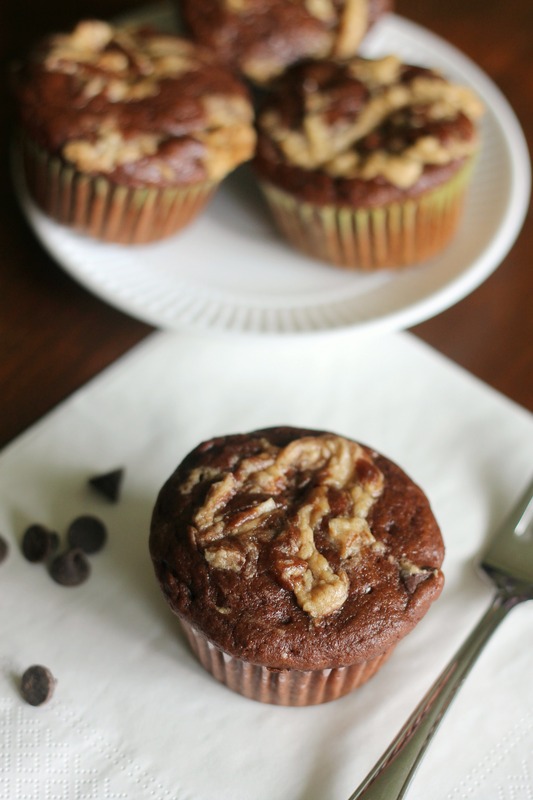 Chocolate muffins with peanut butter swirl? Count me in!